Nigeria youth coach Manu Garba has kept faith with Manchester City duo Kelechi Iheanacho and Chidiebere Nwakali for the Fifa under-20 World Cup in New Zealand. Both players, signed by City after emerging as U-17 World Cup winners with Nigeria in 2013, missed the African Under-20 Championship in Senegal where the Flying Eagles won a record seventh continental title. Garba has retained 13 players from the Senegal squad including Bernard Bulbwa who scored the only goal against the hosts in the final in March. European based quintet Chidera Ezeh, Wilfred Ndidi, Moses Simon, Success Isaac and Musa Yahaya are included in the final 21-man squad but Abdullahi Alfa, Abdullahi Ibrahim Alhassan, Samuel Okon and Christian Pyagbara have all been left out. 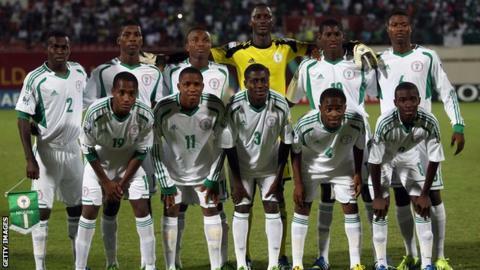 Despite dominating the African scene, Nigeria are still chasing their first success at the World Youth Championship since the tournament began in 1977. The Flying Eagles finished as runners-up at the 1989 and 2005 editions, losing to Portugal and Argentina respectively. Nigeria have been drawn in Group E against Brazil, North Korea and Hungary. Senegal, Ghana and Mali are the other African representatives at the World Youth Championship which is scheduled for 30 May-20 June.